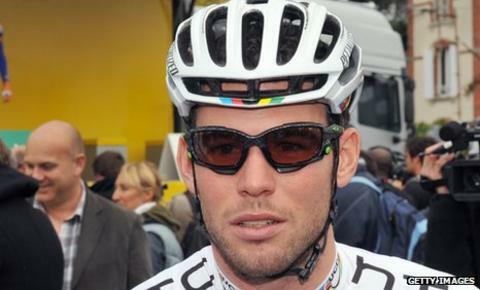 Team Sky have confirmed their squad for the 2012 season, with Mark Cavendish one of eight new signings. Cavendish, 26, won the world road race title in 2011 and was the best sprinter in the Tour de France. Team Sky came second in the International Cycling Union WorldTour team rankings last year. Bernie Eisel, Danny Pate, Kanstantsin Siutsou, Salvatore Puccio, Luke Rowe, Sergio Henao and Richie Porte have also joined the squad. The team, which was set up in 2009, now has 10 British cyclists, including Bradley Wiggins. Team boss Dave Brailsford is confident the group has a successful year ahead. He said: "With Mark Cavendish joining riders like Bradley Wiggins, Geraint Thomas and Edvald Boasson Hagen, we have a hugely talented squad of riders with proven ability at the very highest level of our sport. "We made great strides in 2011, in what was our second season as a WorldTour team. The challenge for all of us is to build on those achievements and become an even stronger and more successful team." Team Sky 2012: Davide Appollonio (ITA), Michael Barry (CAN), Edvald Boasson Hagen (NOR), Mark Cavendish (GBR), Alex Dowsett (GBR), Bernhard Eisel (AUT), Juan Antonio Flecha (ESP), Chris Froome (GBR), Mathew Hayman (AUS), Sergio Henao (COL), Jeremy Hunt (GBR), Peter Kennaugh (GBR), Christian Knees (GER), Thomas Löfkvist (SWE), Lars-Petter Nordhaug (NOR), Danny Pate (USA), Richie Porte (AUS), Salvatore Puccio (ITA), Michael Rogers (AUS), Luke Rowe (GBR), Ian Stannard (GBR), Kanstantsin Siutsou (BLR), Chris Sutton (AUS), Ben Swift (GBR), Geraint Thomas (GBR), Rigoberto Urán (COL), Bradley Wiggins (GBR), Xabier Zandio (ESP).